The goblin shark is a rare species of deep-sea shark. Sometimes called a "living fossil", it is the only extant representative of the family Mitsukurinidae, a lineage some 125 million years old. This pink-skinned animal has a distinctive profile with an elongated, flattened snout, and highly protrusible jaws containing prominent nail-like teeth. It is usually between 3 and 4 m long when mature, though it can grow considerably larger. Goblin sharks inhabit upper continental slopes, submarine canyons, and seamounts throughout the world at depths greater than 100 m (330 ft), with adults found deeper than juveniles. Moray eels, or Muraenidae, are a family of eels whose members are found worldwide. There are approximately 200 species in 15 genera which are almost exclusively marine, but several species are regularly seen in brackish water, and a few are found in fresh water. Sphyrna is a genus of hammerhead sharks with a cosmopolitan distribution in the world's oceans. Members of Sphyrna have a tendency to inhabit coastal waters along the intertidal zone rather than the open ocean, as their prey items such as invertebrates, fish, rays, small crustaceans and other benthic organisms hide in the sands and sediment along these zones. Members of Sphyrna are also known by a large number of synonyms such as Zygaena, Cestracion, and Sphyrichthys. The earliest species described of this genus was Sphyrna zygaena by Carl Linnaeus in 1758, while the latest described member Sphyrna gilberti was discovered and described in 2013. The dusky smooth-hound, also called the smooth dogfish or the dog shark, is a species of houndshark in the family Triakidae. This shark is an olive grey or brown in color, and may have shades of yellow or grayish white. Females live to 16 years and males have a lifespan of 10 years. 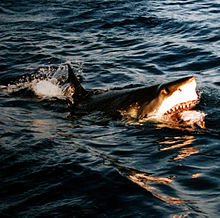 M. canis was the first shark recognised to have viral infections. The great hammerhead is the largest species of hammerhead shark, belonging to the family Sphyrnidae, attaining a maximum length of 6.1 m (20 ft). It is found in tropical and warm temperate waters worldwide, inhabiting coastal areas and the continental shelf. 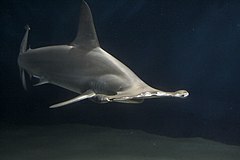 The great hammerhead can be distinguished from other hammerheads by the shape of its "hammer", which is wide with an almost straight front margin, and by its tall, sickle-shaped first dorsal fin. A solitary, strong-swimming apex predator, the great hammerhead feeds on a wide variety of prey ranging from crustaceans and cephalopods, to bony fish, to smaller sharks. Observations of this species in the wild suggest that the cephalofoil functions to immobilize stingrays, a favored prey. This species has a viviparous mode of reproduction, bearing litters of up to 55 pups every two years. 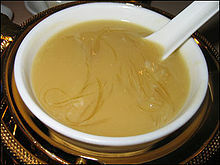 The dusky shark is a species of requiem shark, in the family Carcharhinidae, occurring in tropical and warm-temperate continental seas worldwide. A generalist apex predator, the dusky shark can be found from the coast to the outer continental shelf and adjacent pelagic waters, and has been recorded from a depth of 400 m (1,300 ft). Populations migrate seasonally towards the poles in the summer and towards the equator in the winter, traveling hundreds to thousands of kilometers. One of the largest members of its genus, the dusky shark reaches 4.2 m (14 ft) in length and 347 kg (765 lb) in weight. It has a slender, streamlined body and can be identified by its short round snout, long sickle-shaped pectoral fins, ridge between the first and second dorsal fins, and faintly marked fins. The numbfishes are a group of electric rays in the family Narcinidae. 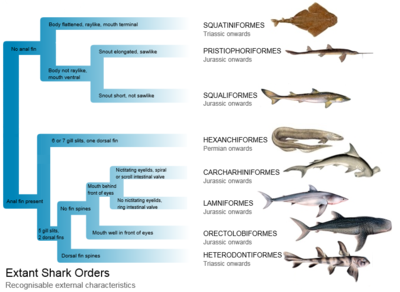 They are bottom-dwelling cartilaginous fishes with large, rounded pectoral fin discs and long tails. They can produce an electric discharge for defense, from which their scientific name is derived. 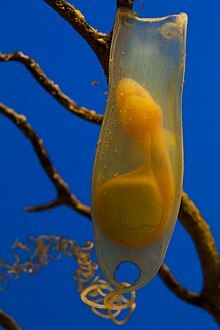 The horn shark is a species of bullhead shark, in the family Heterodontidae. It is endemic to the coastal waters off the western coast of North America, from California to the Gulf of California. Young sharks are segregated spatially from the adults, with the former preferring deeper sandy flats and the latter preferring shallower rocky reefs or algal beds. A small species typically measuring 1 m (3.3 ft) in length, the horn shark can be recognized by a short, blunt head with ridges over its eyes, two high dorsal fins with large spines, and a brown or gray coloration with many small dark spots. 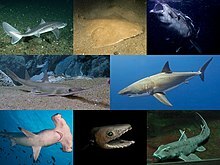 The silvertip shark is a large species of requiem shark, in the family Carcharhinidae, with a fragmented distribution throughout the tropical Indian and Pacific Oceans. This species is often encountered around offshore islands and coral reefs, and has been known to dive to a depth of 800 m (2,600 ft). The silvertip shark resembles a larger and bulkier grey reef shark, but can be easily identified by the prominent white margins on its fins. It attains a maximum length of 3 m (10 ft). 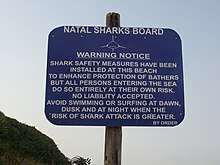 The Caribbean reef shark is a species of requiem shark, belonging to the family Carcharhinidae. It is found in the tropical waters of the western Atlantic Ocean from Florida to Brazil, and is the most commonly encountered reef shark in the Caribbean Sea. With a robust, streamlined body typical of the requiem sharks, this species is difficult to tell apart from other large members of its family such as the dusky shark and the silky shark. Distinguishing characteristics include dusky-colored fins without prominent markings, a short free rear tip on the second dorsal fin, and tooth shape and number. 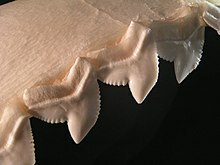 The smalltooth sand tiger or bumpytail ragged-tooth is a species of mackerel shark in the family Odontaspididae, with a patchy but worldwide distribution in tropical and warm temperate waters. They usually inhabit deepwater rocky habitats, though they are occasionally encountered in shallow water, and have been known to return to the same location year after year. This rare species is often mistaken for the much more common grey nurse shark, from which it can be distinguished by its first dorsal fin, which is larger than the second and placed further forward. It grows to at least 4.1 m (13.5 ft) in length. The Galapagos shark is a species of requiem shark, in the family Carcharhinidae, found worldwide. 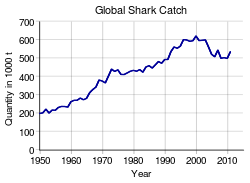 This species favors clear reef environments around oceanic islands, where it is often the most abundant shark species. A large species that often reaches 3.0 m (9.8 ft), the Galapagos reef shark has a typical fusiform "reef shark" shape and is very difficult to distinguish from the dusky shark and the grey reef shark. An identifying character of this species is its tall first dorsal fin, which has a slightly rounded tip and originates over the rear tips of the pectoral fins. The scoophead is a little-known species of hammerhead shark, part of the family Sphyrnidae. It inhabits the tropical waters of the western Atlantic Ocean, from Panama to southern Brazil, and in the eastern Pacific Ocean from the Gulf of California to Ecuador, and probably northern Peru, as well. It is found in shallow, inshore habitats. The viper dogfish or viper shark is a rare species of dogfish shark in the family Etmopteridae, and the only extant member of its genus. It has been found in the Pacific Ocean off southern Japan, the Bonin Islands, Pacific Ocean off northern Taitung County and the Northwestern Hawaiian Islands. This species inhabits upper continental slopes and seamounts. It may migrate vertically, shifting between bottom waters 270–360 m (890–1,180 ft) deep during the day and upper waters less than 150 m (490 ft) deep at night. A slender, black shark reaching 54 cm (21 in) in length, the viper dogfish can be recognized by its narrow, triangular jaws and well-spaced, fang-like teeth. 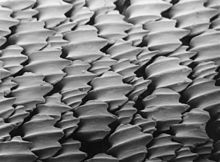 It also has two spined dorsal fins, dermal denticles with faceted crowns, and numerous light-emitting photophores concentrated on its ventral surface. The scalloped hammerhead is a species of hammerhead shark, and part of the family Sphyrnidae. Originally known as Zygaena lewini, its genus name was later changed to its current name. The Greek word sphyrna translates into "hammer" in English, referring to the shape of this shark's head. The most distinguishing characteristic of this shark, as in all hammerheads, is the 'hammer' on its head. 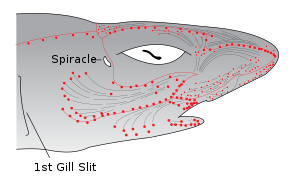 The shark's eyes and nostrils are at the tips of the extensions. This is a fairly large hammerhead, though is smaller than both the great and smooth hammerheads. The Pacific spiny dogfish is a common species of the Squalidae (dogfish) family of sharks and are among the most abundant species of sharks in the world. This species is closely related to Squalus acanthias and for many years they were treated as a single species. Recent research, using meristic, morphological and molecular data led to the resurrection of Pacific Spiny Dogfish as a separate species. The American Fisheries Society recommends the common name "Pacific Spiny Dogfish" for Squalus suckleyi over alternatives such as "Spotted Spiny Dogfish" and "North Pacific Spiny Dogfish" and "Spiny Dogfish" for Squalus acanthias.